The postcard features one of the six remodeled versions of Gary’s Duck Inn. Above it, hovers a platter of fried shrimp. 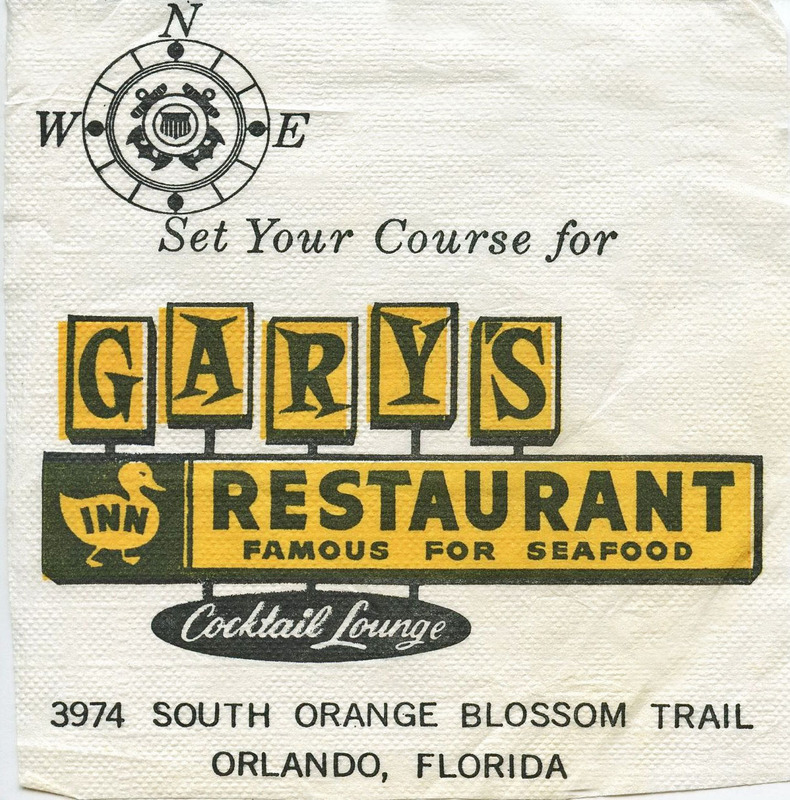 For very close to 50 years, Gary’s Duck Inn was an Orlando restaurant institution and served up their popular fried shrimp on Orange Blossom Trail. 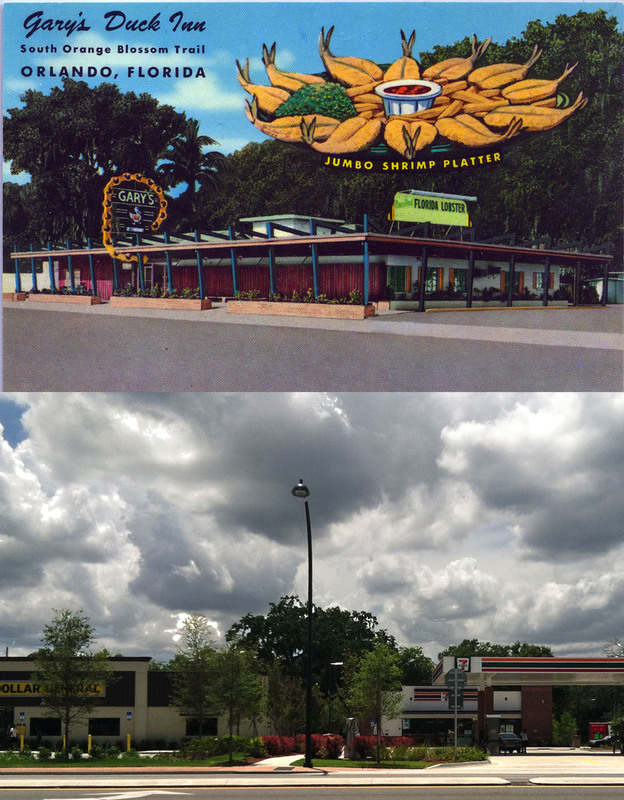 It would be an understatement to say that Orange Blossom Trail was a very different stretch of road when Gary’s Duck Inn opened in 1945. At the time, this was a scenic stretch of road for those traveling north and south through Orlando. For many, a motor inn on Highway 441 was a destination itself. When the restaurant opened, it opened small with seating for 15 people. The popularity of the restaurant over the decades led to 6 different remodels,grew to a capacity of 400 seats, employed 90 people, and served celebrities such as Dolly Parton and Bob Hope. inspiration Darden and Woodsby used to create Red Lobster restaurants. 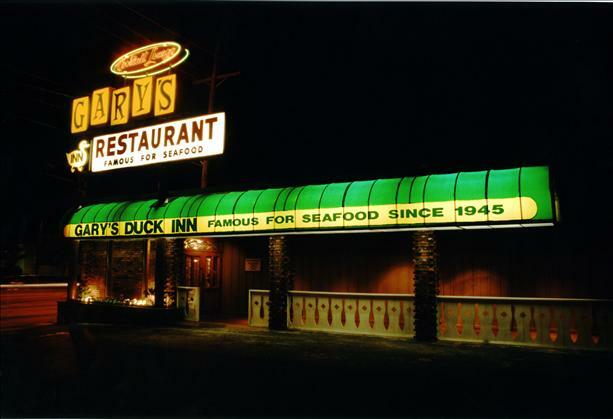 After inspiring a national chain restaurant, Gary’s Duck Inn continued to operate for another three decades. As the years went by, fewer and fewer tourist (and locals for that matter) traveled down the Orange Blossom Trail. The area was in decline and became better known for stripper bars than a good plate of fried seafood. David Siegel of timeshare and “Queen of Versailles” fame made an attempt to purchase the restaurant for $375,000 and even attempted to recreate Gary’s by opening a restaurant called Fisherman’s Cove with some of the managers from Gary’s. Neither was successful, Gary’s Duck Inn shut its doors in 1994. Along OBT, there are still several weathered reminders of its past days as a tourist destination. Sadly, Gary’s Duck Inn is not one of them. Demolished long ago, on the site today sits a 7-11 and a Dollar General.